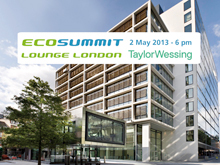 Ecosummit and Taylor Wessing, the international law firm with extensive cleantech and private equity experience, co-host the second Ecosummit Lounge London on 2 May 2013 at Taylor Wessing’s magnificent office. 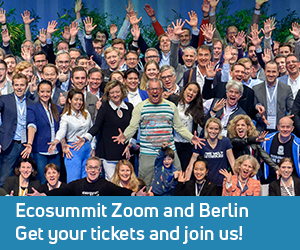 We will enjoy an inspiring evening of smart green business networking with a group of local and international cleantech startups, investors and corporates. Rob Wylie, Partner at WHEB Partners, gives a keynote on the current state of cleantech venture capital, followed by startup pitches of the 3 ECO13 Award Nominees Ubitricity, Tado and Loowatt. Tickets are available for £30,00. Thanks a lot to Simon Walker and his team for hosting us and sharing the super cool roof terrace.